While many people focus on the shape and alignment of their teeth when evaluating their smile, the appearance of the gum line affects smile aesthetics and symmetry as well. This is very important for a balanced smile line. A set of beautiful white teeth is best complimented by healthy gums. At our office, Dr. Kashani can lift the gum line in cases of a "gummy smile" where it covers more teeth surface than desirable, or pull down the gums in cases where the gum line has receded. A gum lift is a safe, fast, and permanent solution for gums that would benefit from being readjusted. To prepare for your gum contouring, make sure to floss daily to reduce chances of inflammation caused by infection or irritation to the gums. First, your gums will be evaluated. Your gum tissue should be healthy—firm, with a light pink color, and with no inflammation. When this is achieved, a topical anesthetic is used to numb the areas that will be treated, and a local anesthetic is used. Dr. Kashani will take off any gum tissue that covers the tooth excessively, and ensure that the gum tissue frames your teeth evenly. The procedure uses lasers to safely remove excess tissue. The use of laser technology seals blood vessels during tissue removal, minimizing bleeding, and shortening recovery time. After your gum contouring, do not eat or drink anything until the anesthesia has worn off. Taking an over the counter pain reliever should be enough to ease any discomfort. In cases that need more than a minor gum lift is needed, the periodontist will see you for a "crown lengthening" procedure. In the days after your gum lift, your gums should heal very quickly. To speed up the process and prevent any complications rinse your mouth gently with a non-alcoholic mouthwash, floss each day, brush gently and often to stop plaque buildup, and avoid smoking and other activities that slow healing. After two weeks of healing, any veneer or crown procedure can be started. Since the results are permanent, it is important that your cosmetic dentist is experienced with the procedure and takes the time to perform the gum contouring correctly. 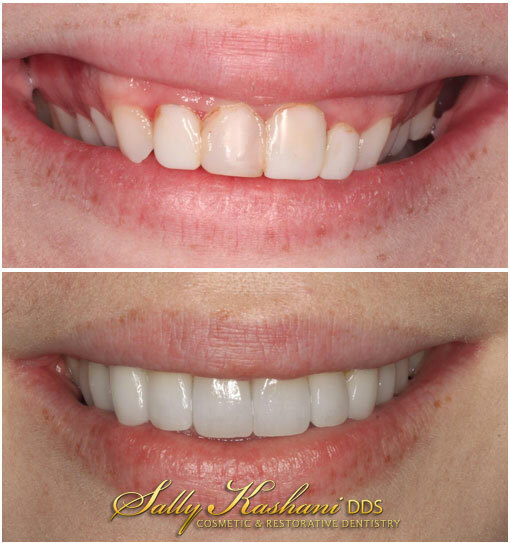 Dr. Sally is an expert in this area and uses extra care and precision to help you achieve your best smile. Consult our office about gum contouring and other cosmetic treatments.